The Notebook is made with synthetic vegan leather. It comes in the “Iconic Version” where the cover is engraved with doodles or the “Pro Version” without the doodles. Both come with a bright contrasting elastic band. Or if you’ve chosen a lovely pastel one, the elastic band is a slightly deeper shade to the actual notebook. The cover itself is thick and durable and claimed to be waterproof and sweatproof. Sorry, but I haven’t tested either of these claims – the thought of pouring water over my journal or rubbing it over my husband’s sweaty chest is not a risk I’m willing to take. I’ll just accept the claims as truth for now. The Scribbles That Matter back pocket, the cute doodles from the cover also appear on the inside covers. 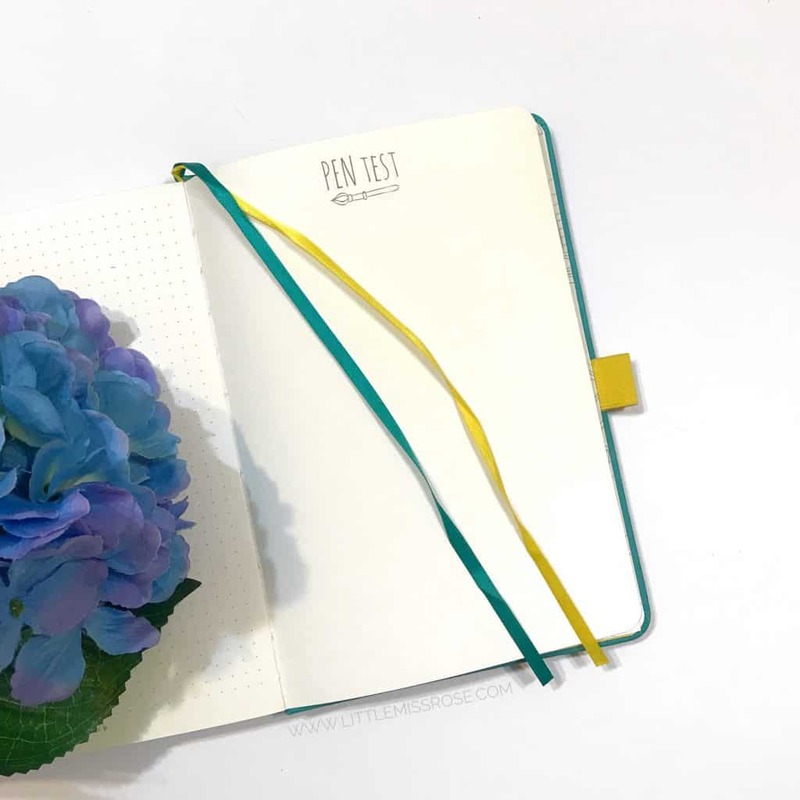 When you first open the notebook, there is a page for you to write your name and address. 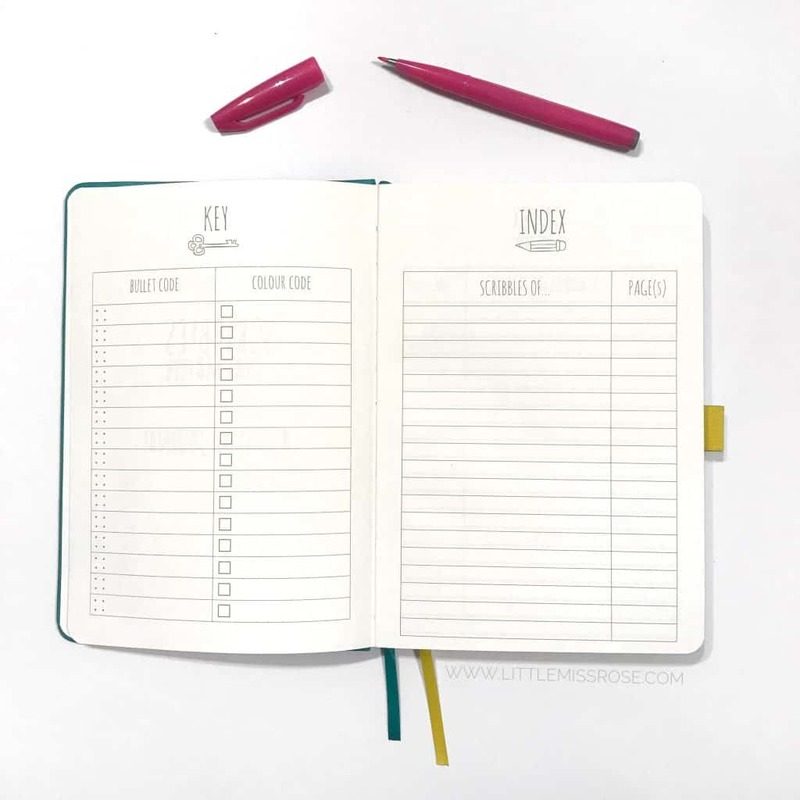 Then there is an index and also a colour code and bullet journal key, ready for you to fill in. This can be a huge time saver if you always use these three items. If not, then it does use up valuable space in your journal. Now for the paper. The paper is 100gsm, so pretty thick. You’ll find it a lot thicker than the Leuchtturm. And it is very smooth. 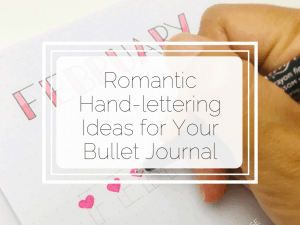 Your brush pens will just glide along these pages. I love these pages as there is very little ghosting and I’ve never had any trouble with bleed through. 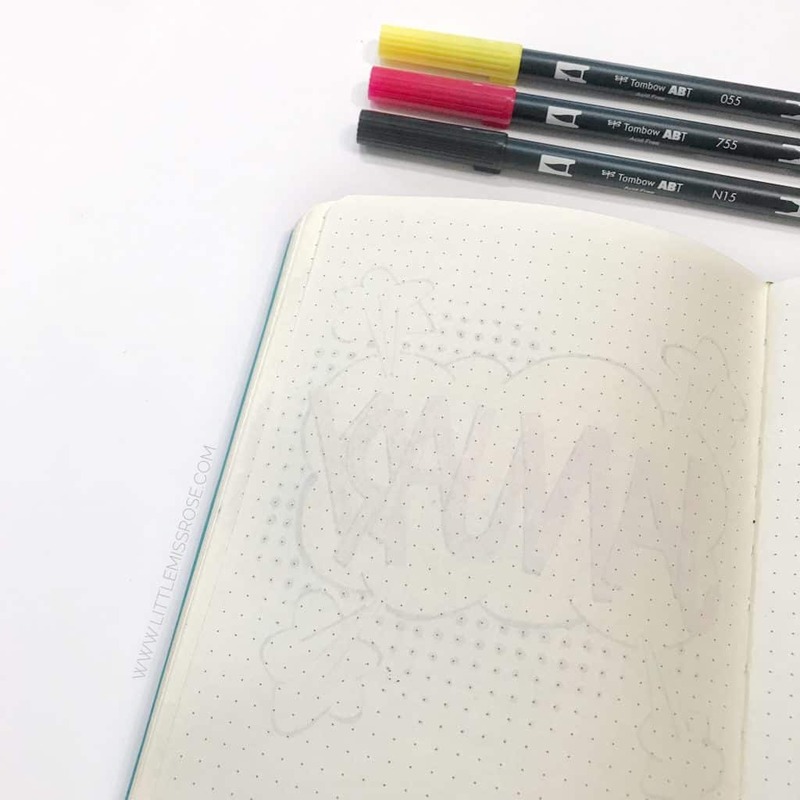 I have used all sorts of pens in this notebook – Staedtler Pigment Liners, Sakura Microns, Muji gel inks, pilot get inks, Triplus fine liners, Mildliners, Tombow Dual Brush, Pentel touch, and even a fountain pen. I am super happy with the way that this paper holds up to all my favourite writing instruments. 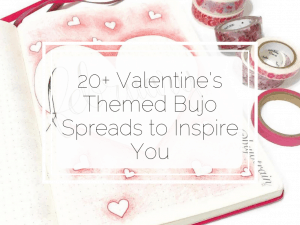 However, the only drawback is when using water – such as watercolour paints or with your Tombows – you do have to be wary about how much water you use as it can bleed through the page. Here is an example of watercolour used in the notebook. I’ve had to restrain myself when using water, as using too much of it can cause the pages to pill and bleed through to the other side. I’ve tried using water with Tombow Dual Brush pens as well and it is very hard to get colours to blend without destroying the pages with too much water. However, if you’re careful, don’t be afraid to use water in the Scribbles That Matter. In this photo, I’ve used Tombow Dual Brush pens on their own to colour in my January page. The colours still appear bright and vibrant. As you can see there is still ghosting, but this has been the worst of it in the 6 months of using this notebook. And considering the heavy use of colour, especially black, I think the pages have handled it incredibly well. There is an added bonus of an actual Pen Test page at the back of the notebook where you can test out your pens on the paper before using them in your spreads. This is super handy if you hate bleeding and ghosting. Now you have a defined place to test your pens! As you can see, the Scribbles That Matter Notebook also lies open completely flat, which is great for working on your double page spreads! 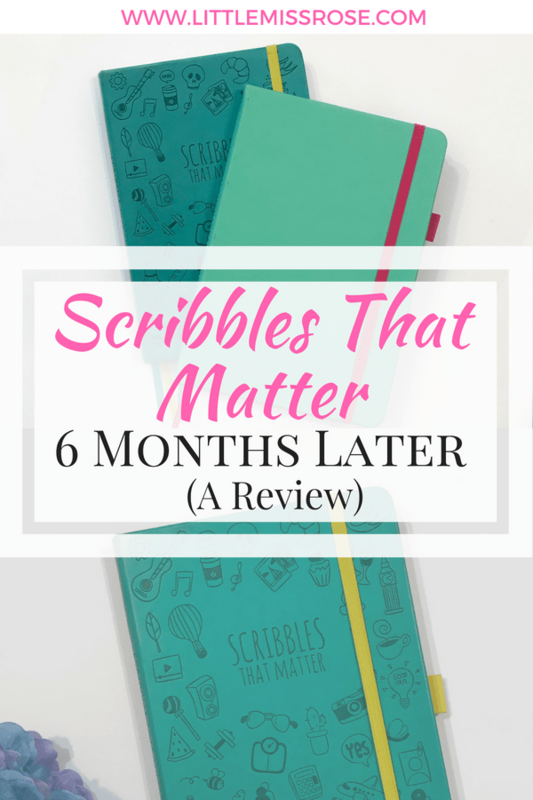 Not only is the Scribbles That Matter a great notebook on all fronts, it comes at a great price as well. They are currently on Amazon and available at around USD20, especially as my last one lasted me 6 months! It’s definitely worth the small investment! All their products are FSC certified, this means that the notebooks are made from sustainably managed resources. Which is great for the environment! 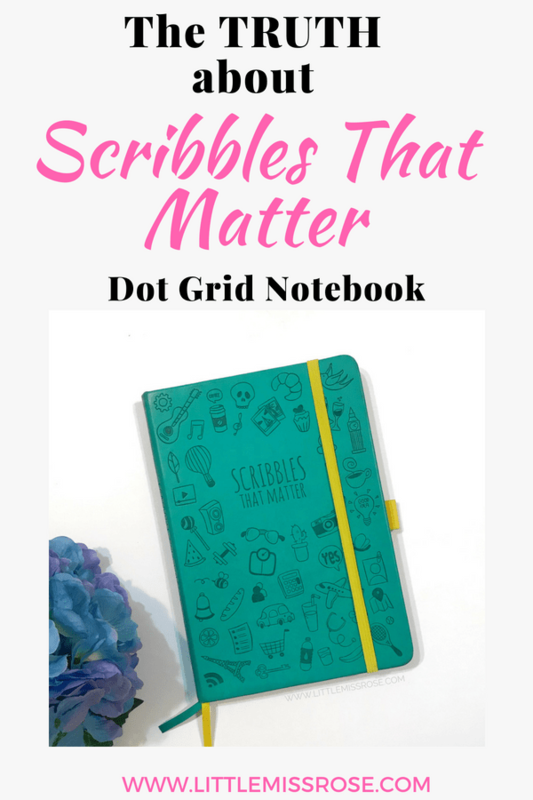 I have used an A5 dot grid journal, but Scribbles That Matter notebooks also come in A4 size and a mini pocket size version. All sizes come in either grid or dot grid. They have also just released an all Black version, which looks a lot more professional and luxurious. 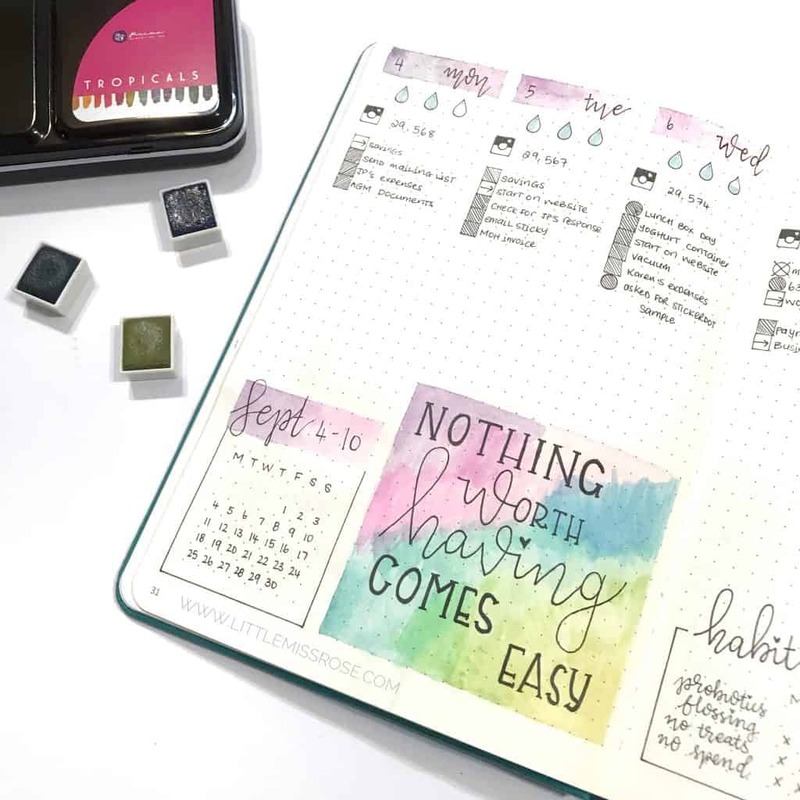 As well as this, there is also a Scribbles That Matter Bullet Planner. So if you do not have the time or inclination to set up your own spreads, this journal has pre-printed templates for you! 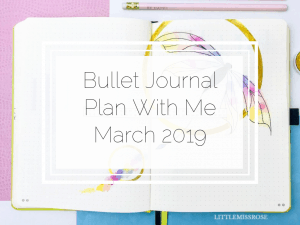 It’s a hybrid of a bullet journal and a planner. 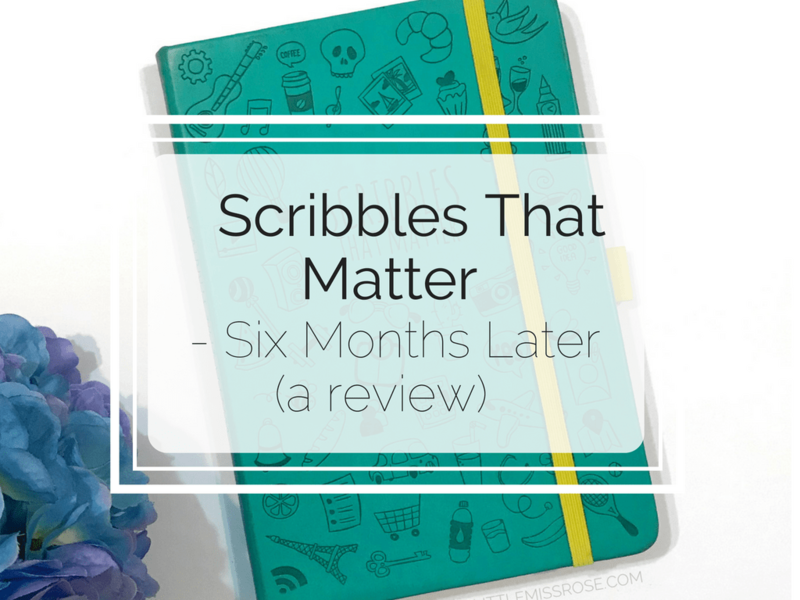 I would definitely recommend anyone purchase a Scribbles That Matters notebook to use as their bullet journal. I absolutely love the quality of the paper and I love the colours of the notebooks themselves. If you’re interested in buying one of these yourself, then you can find them here on Amazon. It’s a huge thumbs up from me! 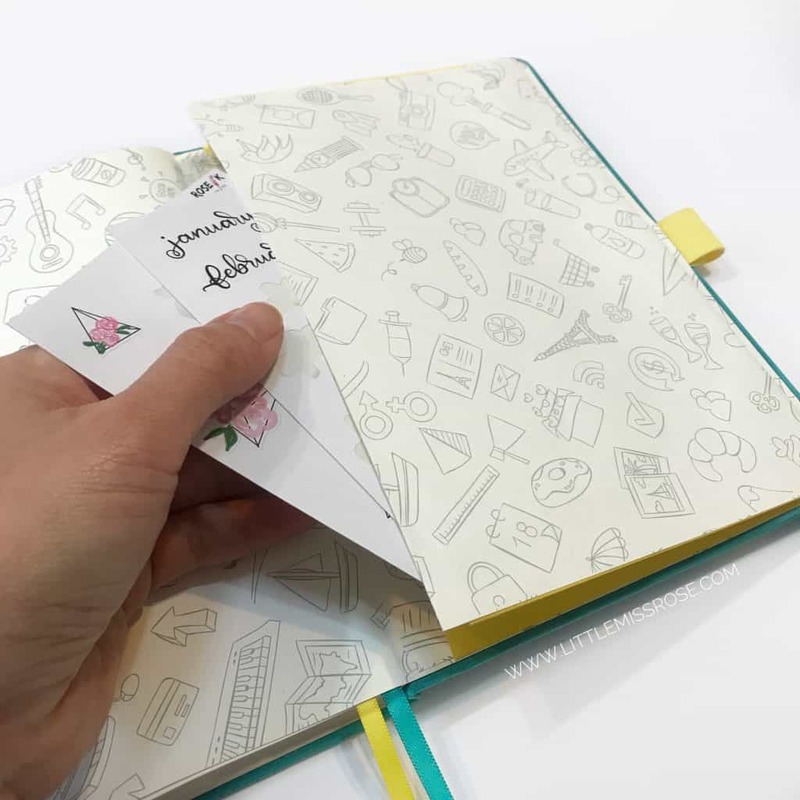 If you’re interested in other notebook reviews, check out this review on Dingbats Notebooks. Are there any other notebooks you want me to review? Just let me know in the comments! Thank you for this! 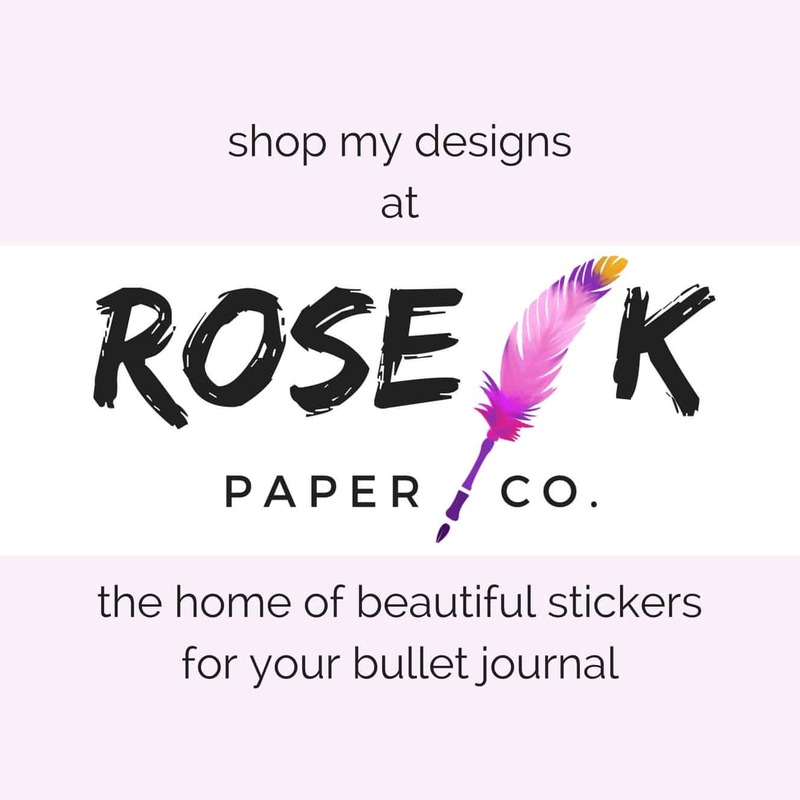 i was debating getting a STM for my new bullet journal! I don’t mind about the water retention so it sounds perfect. You’ll love it! It’s is my favourite journal! I’ve been using the Leuchtturm for the past 2 years or so… anyway, came across STM and I like them. About to order one. One question… nowhere to find how many (numbered) pages are in these notebooks? Any help about that? Thanks! The STM has 201 numbered pages! I hope that helps you! I’d love to review that one, but I don’t actually have it yet. I have the pink version which has 100gsm pages. I’ll review this one at some point! 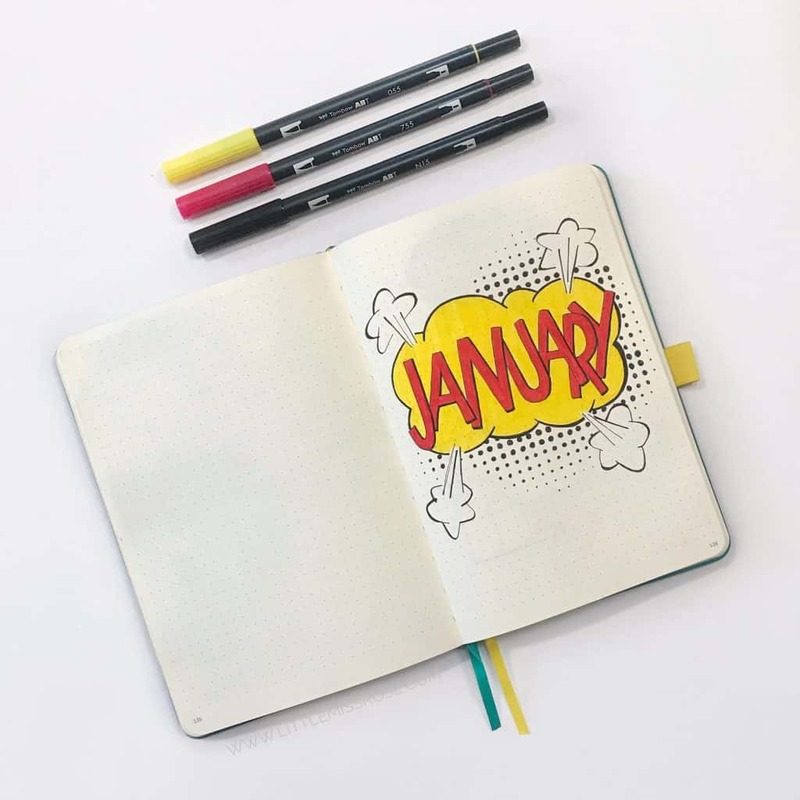 Thanks for sharing with us your thoughts about this notebook. I’ve reviewed the Dingbats wildlife https://littlemissrose.com/dingbats-notebook-review/ and I have a Dingbats Earth which I will review shortly. I also have a Lemome but the 100gsm which I will also review! I just purchased the STM journal so I’m SO glad that you liked it! I’m super excited to try mine now! Yay! I hope you like yours! I have heard that STM may have changed their paper since I used mine. I hope it’s still up to quality! Please let me know how you go with your STM! !